I've loved the idea of having guests offer up bits of advice, funny stories, and bits of love to share with the happy couple in the form of a guest book, it just seemed so personal and loving. As I mentioned in my venue post, we'll be holding our ceremony underneath the magnolia tree. One day, while browsing more guest book ideas, into my head popped the idea of having our guests write little bits of advice on cards and hang them from a mini-magnolia. Perfect! As great as having guests hang advice on the tree is, I also would like to have a small tree to plant as a symbol of us in our at our future home. Magnolia's are fairly slow growing, so I have a few years before we really have to settle down with our little tree. 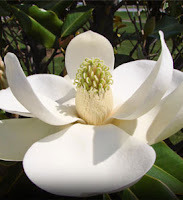 I hopped on the Arbor Day Foundation website, and found a Southern Magnolia for super cheap, so I snatched it up quick! It should arrive sometime in the next 2 months, as they ship them as is best for your "zone". When our magnolia arrives, it will be between 6 inches and a foot tall. I'm really excited! I already cut out the circles for guests to write on, and plan on tying the ribbon shortly. We can't wait to read what everyone writes! I'll update again when our mini-tree arrives!